NASA's Parker Solar Probe has cleared the final procedures in the clean room before its move to the launch pad, where it will be integrated onto its launch vehicle, a United Launch Alliance Delta IV Heavy. This is an historic mission that will revolutionize our understanding of the sun, where changing conditions can propagate out into the solar system, affecting Earth and other worlds. Parker Solar Probe will travel through the sun's atmosphere, closer to the surface than any spacecraft before it, facing brutal heat and radiation conditions—and ultimately providing humanity with the closest-ever observations of a star. 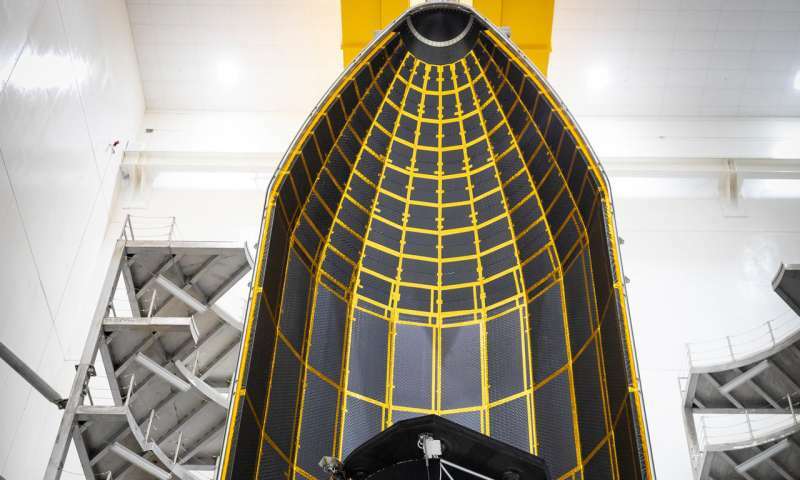 Seen here inside one half of its 62.7-foot tall fairing, the Parker Solar Probe was encapsulated on July 16, 2018, in preparation for the move from Astrotech Space Operations in Titusville, Florida, to Space Launch Complex 37 on Cape Canaveral Air Force Station, where it will be integrated onto its launch vehicle for its launch that is targeted for August 11, 2018.